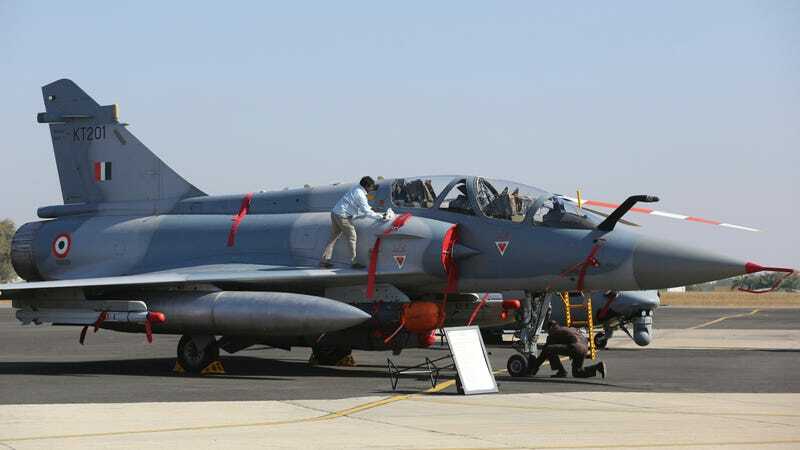 An Indian Air Force Mirage 2000 fighter of the same type that carried out the air raid on Pakistan on February 24, 2019. The rivalry between neighbors India and Pakistan, which has resulted in multiple wars over the past seventy years, heated up Monday night with a cross-border air strike by Indian forces, which reportedly killed 300 militants. Over Tuesday night the situation escalated with direct combat between the two countries, including the alleged shootdown of two Indian MiG-21 fighter jets, an Indian helicopter, and a Pakistani F-16. The potential for an all-out slugfest between the two countries is made exponentially worse by the fact that the two countries both maintain stockpiles of nuclear weapons. A crisis between the two could quickly spiral into a full-scale conventional war, then nuclear war, with grave consequences not only for the region but the entire world. But there are particulars of this conflict as well as policies from these two countries that could keep nukes out of the sky, things the rest of the world could learn from. India and Pakistan are two of the world’s most intractable foes. The two countries, originally making up a majority of the British colony of India, achieved independence in 1947. This kicked off a bloody partition that killed up to two million people, as Hindus and Sikhs fled east for what would later become India and Muslims fled west to what would later become Pakistan. The two states became bitter enemies, a problem exacerbated by a disputed border that includes the Kashmir region. Kashmir, with Muslim residents making up 60 percent of the 15 million people who live there, was split up between India and Pakistan. A 435-mile-long border known as the Line of Control divides Indian Kashmir from Pakistani Kashmir, with troops from both sides manning their respective sides. As a result of this baked-in tension India and Pakistan have fought four wars since independence, in 1948, 1965, 1972, and 1999. Three out of those four wars were fought over Kashmir. India claims that Pakistan trains and equips Muslim guerrilla forces meant to weaken India’s hold over Kashmir and eventually bring the entire region under Pakistani control. These forces launch periodic attacks against Indian military and paramilitary forces, which they consider occupiers. Pakistan denies it has any links to these guerrilla forces. Indian Army troops in Kashmir, 2002. On February 14, a convoy of Indian paramilitary forces in Indian Kashmir was attacked by a car bomb, killing 46 troops. The terror group held responsible for the attack, Jaish-e-Mohammed (“Army of Mohammed) is considered a Foreign Terrorist Organization by the U.S. government and has openly declared war against the United States. India has repeatedly accused Pakistan of supporting Jaish-e-Mohammed and other groups as proxies to undermine Indian control of Kashmir. India-Pakistan map. The location of Monday’s air strike, Balakot, is just a short distance north of Lahore. Note that Google, accessed here from the United States, criss-crosses Kashmir with dotted lines, but it actually changes the map depending on which of the two countries a Google Maps visitor resides in, exacerbating the problem. On February 25, India struck back. Twelve French-made Mirage 2000 fighter bombers from the 1st “Tigers” and 7th “Battle Axes” fighter squadrons took off from bases in India. Armed with 2,000 pound laser-guided bombs and escorted by Sukhoi Su-30 MKI fighter bombers, the Mirages flew at low level forty miles into Pakistani territory and bombed what India claims was a JeM training camp outside the town of Balakot. Like all modern, preplanned air strikes, the strike took place late at night (3 a.m. local time) and was conducted with tanker and unmanned surveillance aircraft support. India claims that around 300 JeM militants were killed in the bombing raid, while Pakistan claims the air strike dropped munitions on a patch of empty land. Meanwhile on the ground, the two sides are shelling one another with artillery. On February 26th an Indian Mil-17 military transport helicopter crashed and was possibly shot down. Pakistani forces also shot down at least one, and maybe two, Indian Air Force MiG-21Bis fighter jets. Pakistan claims to have at least one Indian pilot in custody. For their part, Indian forces claim to have shot down a Pakistani F-16 Fighting Falcon, as well. India’s Agni III ballistic missile on parade, Delhi, 2009. Both countries have nuclear weapons, and the volatile relationship between the two could turn spur a spat into a skirmish, a skirmish into a conventional war, and a conventional war into a nuclear one. A nuclear war on the subcontinent would be the first use of nukes in anger since 1945, threatening the 1.6 billion people of the two respective countries with nuclear annihilation, and would scatter dangerous radioactive fallout across Eurasia and beyond. India detonated its first nuclear weapon in 1974, and today the country has between 100 and 200 nuclear weapons. The nukes are divided between Prithvi and Agni land-based missiles, aircraft delivered bombs, and submarine-launched ballistic missiles. Pakistan has an estimated 110 to 130 nuclear warheads, deliverable by Hatf land-based missiles and aircraft-dropped bombs. A number of factors make a nuclear war between the two countries a disturbing possibility. The sheer number of wars the two countries have fought and the deep-seated religious and nationalist rivalries is one factor, and the close proximity of the two countries to one another makes it harder for the two sides to disengage from a crisis. Non-state actors with their own agendas, like JeM, could instigate a crisis for their own purposes. Pakistan’s Hatf-IV short range nuclear capable ballistic missile. Once battlefield nukes start flying, the close proximity of one country to the other means that each will constantly fear escalation by the other side to include nuclear strikes on cities. Each side would have just minutes to detect, identify, and retaliate against such a nuclear attack, leading to the possibility that one side might choose to strike first to gain an advantage. The current situation probably will not lead to nuclear war. Both sides had nuclear weapons during the 1999 war, and the conflict gradually de-escalated to a cease-fire. Still, whenever two nuclear powers go to war—and these two literally go to war all the time—there is an inherent risk of nuclear conflict. India also has a strict No First Use policy, meaning it will not be the first to use nuclear weapons in war. While that is reassuring, it would be much more reassuring if both sides had such a policy. Come to think of it, it would be much more reassuring if all nuclear powers had a No First Use policy.